After being left out of the Australian side for several months due to a severe toe injury, pace bowler Mitchell Johnson has revealed that he is glad to be back in the side and is looking forward to the upcoming Test series against South Africa. 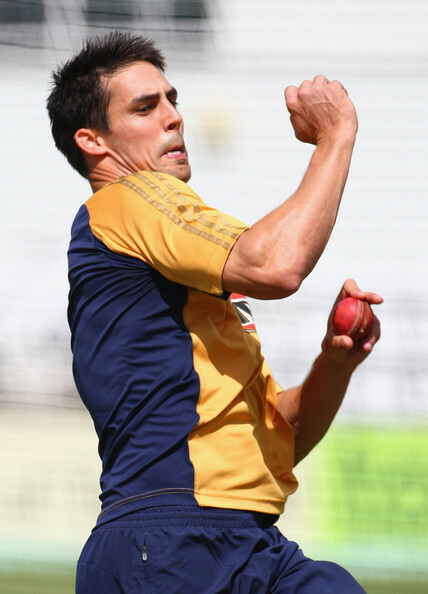 Johnson recently represented Australia in their limited overs series triumph over Pakistan, and after failing to make the cut for the International Cricket Council (ICC) World Twenty20 squad, Johnson stated that he would be using the time to concentrate on his bowling and work on his match fitness. Johnson is also looking to regain some confidence before the start of the South Africa series, and in order to do so, he stated that he would be looking to play some domestic cricket in Australia. “I’m not looking at Test match cricket. I’m just looking to play for WA (Western Australia) and get a bit of cricket under my belt, going to England and playing for Australia A was good just to get back into things and then going over to Dubai and playing in those conditions helped get me in a good position right now with my fitness and just get some bowling under my belt,” Johnson added. Australia have a hectic schedule ahead of them, and Johnson is training extra hard to ensure that he gets a call-up as well. “I’m starting to feel really comfortable again with my game. I’ve been able to work on a few things in the time I’ve had and I think that showed in the tournament against Pakistan, I’m really excited about the future. I feel like I’ve got lots to give inAustralian cricket, whether it’s for Australia or WA, I’m always going to go and give it my best,” Johnson said. This entry was posted in Uncategorized and tagged Australia, bowling, call-up, concentrate, confidence, cricket, domestic cricket, glad to be back, hectic schedule, ICC World Twenty20, match fitness, Mitchell Johnson, Pakistan, South Africa, toe injury, training. Bookmark the permalink.